Life, love, crafts & everything in between. The costume is for a toddler and since we’re making a dress rather than a skirt, cutting the pieces of tulle will be a lot easier. 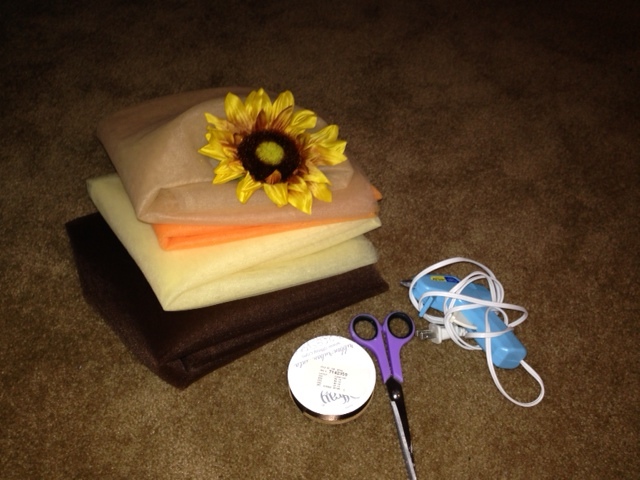 Here are step by step directions- it’s a little time consuming but ridiculously easy! Step One: Cut your strips so that they would reach the child’s ankles if held up to their chest area. 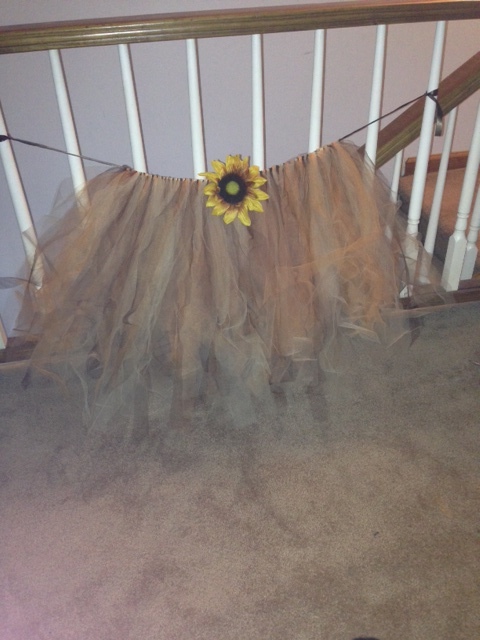 Since this dress was for a two-year-old, I just cut the tulle as it was already folded, width-wise. Each yard of tulle produces around 36 one-inch strips. There’s no set guideline on how much tulle you need to use, but the more you use, the fuller the dress will be. I personally used 2 yards each of orange and yellow, and 1 yard of brown and tan. That gave me roughly 216 strips to work with; I know that sounds like a lot, but it takes a lot to have a nice, full dress. Step Two: After you cut all of your strips, you’ll need to cut your ribbon that you attach the tulle strips to. The ribbon needs to wrap around the child’s chest and tie into a bow. Again, this doesn’t need to be exact because you can adjust the size by making the bow bigger or smaller depending on how it fits on your child. If you want to be exact, just measure around the child’s chest then add a decent length for the bow. 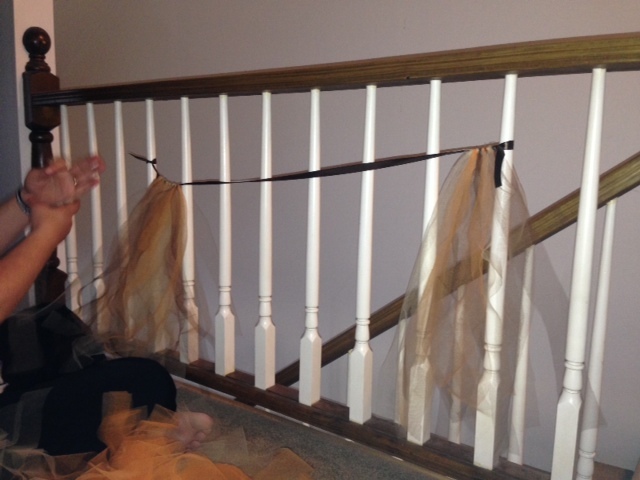 We tied the ribbon to the banister to make it easier to attach the strips… trust me, this saves a lot of time & frustration! Step Three: To attach the tulle to your ribbon, you simply take the folded material and pull it through itself around the ribbon. As you do this, pull firmly but carefully as to not rip the tulle. This is the time-consuming part! 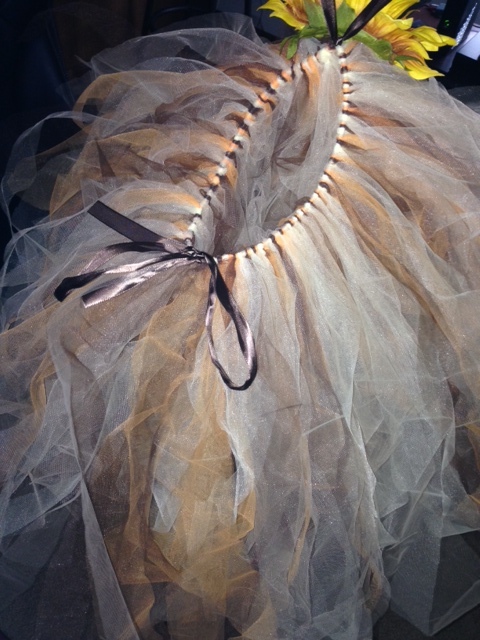 Continue to attach all the pieces of tulle until you reach the desired fullness. Step Four: Now you’re going to add another piece of ribbon to your dress to act as the halter top of the dress. To do this, take the ribbon and tie it in a knot in the center of the front of the dress. Then when you’re little girl wears it, tie it around her neck in a bow! 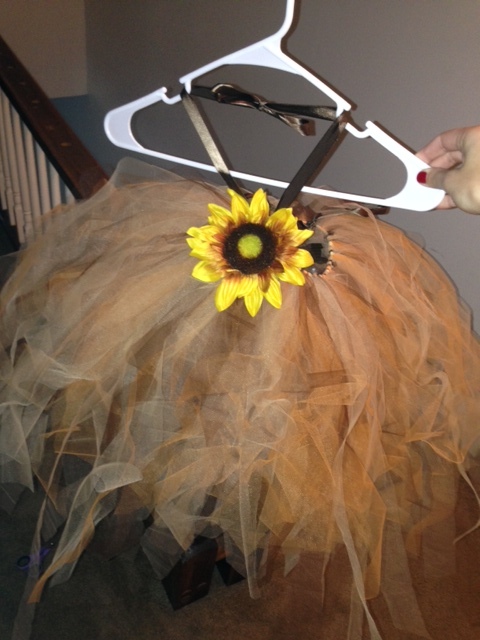 Step Five: The 5th and final step is the easiest: plug it the hot glue gun and attach your sunflower to the front of the dress, right over where you tied the ribbon for the straps. You’re done! Working with tulle is one of my favorite crafts because there’s so much wiggle room for errors. The pieces of tulle don’t need to be perfectly cut because once they’re attached, you can’t even tell! Also, the fact that you can make a costume without busting out the sewing machine is always a plus. 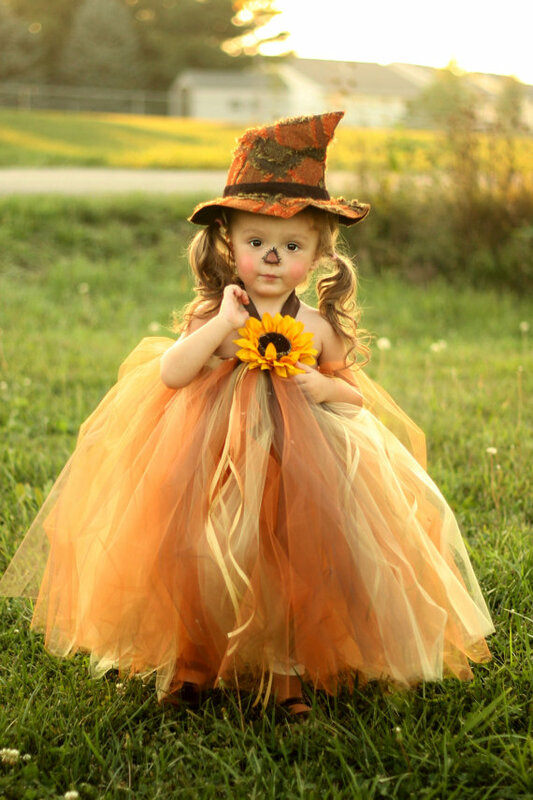 What are your littles one dressing up as for Halloween? Are you going the DIY or store bought route? A Merry Christmas In… on Oops, I did it again.